So I have been threatening this since 1st Edition gave way to 2nd, but I think I finally might be able to pull this off. I was inspired by the new Forgotten Realms smashing Abier into Toril to make a new world that I wanted to bring back a smash up I loved. Plus given all my love for the old-school movement, I think it is time for me to pull out my favorite old-school worlds. 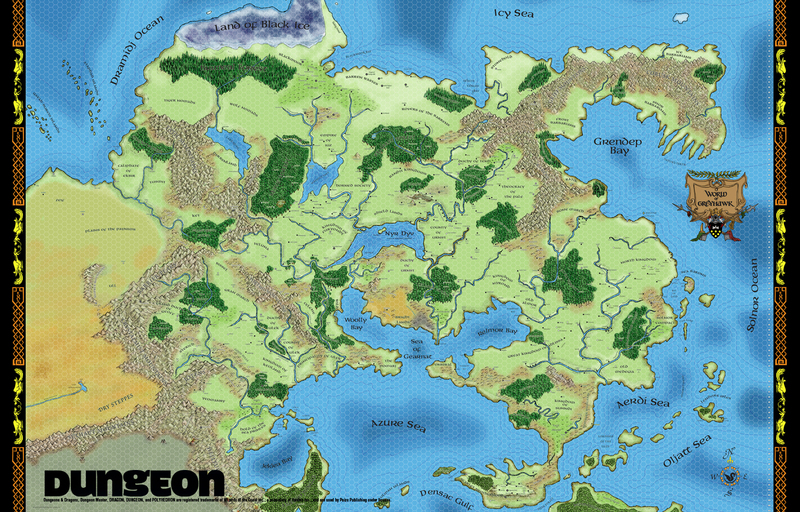 This combines Mystara (the Known World of BECMI/RC D&D) and AD&D's Oerth. This map is based on the work of James Mishler and Chatdemon. Given this combination I am most likely to run this under my house-rules Basic Fantasy game that melds D&D and AD&D1 together. Though I would write anything generically enough to handle any version of the game. Both worlds have Blackmoor so I can use its destruction as a common element. I get to keep all the well defined areas of both worlds, leaving a bunch of areas to be developed. Both also have a Hyborea which is nice. In the case of Mystara's "Arypt" and Oerth's "Erypt" I simply combine them to "Ærypt" and use Gary Gygax's "Necrocopolis" from SSS and some of the ideas from his Mythus game. For the long dead Blackmoor use Blackmoor from all the new Dave Arneson supplements. There will be a "Graveyard of the Dragons" from the D&D cartoon (one of the few cool episodes) and it serves as my lost Melniboné-like kingdom of a long dead race and the current home of the Dragonborn. I have also decided that the world is not hollow (Mystara) and it does not sit in the center of it's solar system (Oerth); intellectual conceits on my part. It does have three moons, two of which can be seen and third that is invisible (Celene, Luna and Lilith). I have a spot for Kara-Tur but the descriptions would have to be changed to fit the realities of the maps. Though I have also considered recently to use some Forgotten Realms goddesses, so the moons might end up being named Sehanine, Selûne, and Shar. In fact, I like that a lot. Sehanine actually has a foothold in Greyhawk anyway and Selûne and Shar are very Greyhawk like. Gods will be gods, but characters still have the chance to become Immortals. In some cases an Immortal might be more important to a region than say a God, who might aloof and distant. Immortals still involved themselves in world affairs. So I am totally stealing this from both the BECMI/RC Immortal rules and the Epic level tier from D&D 4. The last year in Mystara was 1200 AC (Alphatian Calendar) according to the books. The last year in Greyhawk iwas 591 CY (Common Year) according to the books. I used the destruction of Blackmoor as a common element, and I came up with the date of -3000 AC and -3746 CY as the date (no idea how I did that). My present day according to my Excel spreadsheet (which was still in Excel 97 format) is 1661 AC and 915 CY, or about 460 years after the Gazetteers and 324 years after the Greyhawk books. Again, kind of a nod to the new FR book, but I still plan on playing this world with Old School rules. So what would my world be like? Well here are a bunch ideas I have considered for other games and game worlds in the past. Most of these are random ideas. I'll start with races first and then get into cultures and history later. Orcs are still brutish, prone to violence and often in the employ of evil overlords, but orcs themselves are more mercenary. I would borrow a lot from Warcraft and Shadowrun, and a LOT from John Wick's Orkwolrd. I would make them more a more proud, tribal race. Orcs are still the ancient enemies of the elves, but because orcs tried to settle in elven lands and the elves attacked them. Orcs are still arrogant and prideful and take the smallest slight or insult as challenge to death. Male Orcs are expected to be warriors, female Orcs are expected to raise children and become the shamans of the tribe. An orc will still mostly like attack first and ask questions later. Most orcs have difficulty learning Common, and are thus often seen as stupid. While an orc is generally no less or no more intelligent than a human, it is their prowess in battle that determines their social rank and not their intellect. To an orc there is nothing greater than glory in battle. To die in battle ensures them a place at Gruumish's side in the orc afterlife. Half-orcs are not the result of orc rapes of human women, orcs are far too proud for that; only orc females are worthy enough to bare orc children. Half-orcs are the result of orcs and humans living with close confine to each other for mutual survival and sometimes the will of an overlord looking for the strength of orcs and the intelligence of humans. Goblins are small and crafty. While obviously related to orcs they are smaller, a little more cowardly, and fond of human cities. Goblins in the wilderness areas are typically bugbears or hobgoblins. Real goblins want to be where the crime is. Attracted to money, goblins will run all sorts of scams in order to obtain more. They rarely have the talent to run businesses and the concept of a banker or even an account (someone that deals with someone else's money) is an unheard of concept to a goblin. Money is to be kept in an old sock under the bed or better yet, held on the person. Goblins can learn to speak a large number of languages, mostly to deal with other races. Goblins can interbreed with just about anything humanoid, but the offspring is always a goblin. Hobgoblins and Bugbears are larger and more evil, believed to be an ancient goblin/demon or goblin/devil crossbreed. Yes, I'd like to try out some Dragonborn in my old-school games. They live on a small island ("Fireland" on the old World of Greyhawk maps) that is full of active volcanoes. Think of Iceland, only with dragons. The "Dragon Isle" would be a cross between Iceland, Melniboné and the Graveyeard of the Dragons. Dragonborn are an ancient race that have been inactive for centuries. They would take the place of the "dying race" in my games. Something that elves, dwarves and gnomes have done previously. This is place where it is believed that dragons first entered the world. Elves are much like they are now. I'll borrow a lot for various editions and have a bunch of different elven races. Right now I plan on using High (Eladrin), Wood, Valley, Grey, Moon, Sun, Desert and Gypsy Elves. Drow are evil elves in my world, but I want to take them back to the days of G123, D1-2, D3 and Q1 when they were secret evil masterminds. I will incorporate some ideas I have had about "night elves". I am also considering making drow albinos. Drow had been Night Elves/Star Elves before their fall. Dwarves will have a more prominent role in the world. Much of what is considered "elvish" stereotypical will fall to dwarves. They are the most populace after humans. Dwarven females do have beards and a dwarf woman without a beard is considered to be too young to marry or to be cursed. What I wanted to do with them has been done in 4E, so I am likely to use them as their appear there. Going back to the roots and Halflings will be Hobbits. One of my few purely evil races. Mind Flayers came "from beyond the Stars". Their goal is the conquest of all. They have a mad plan to blot out the sun and leave the world in cold darkness. Another evil race Saurians (lizard men, troglodytes, and the like) battled the Dragonborn back when the world was young. They also seek to rule the world and place all the mammals under their yoke. Not green and rubbery, but rather like thin ogres. They are for the most part unchanged but are closer to the trolls of Norse myth. Awesome, glad to see someone expanding on the idea of that map! So happy you stopped by. I love your map and have been very inspired by it for a while now. Care to share any insight you have on how you put it together and if you used it at all in your own games? Hm. Looks more like a variation of Earth shortly post-Pangaea. To the north west, is clearly North America. To the south west is the super-continent of South America, Africa, and Antartica. To the north central area of the map is Asia. The Oerth area is sort of taking the place of China/Korea/Siberia/Japan, in a way. I'm not as familiar with Mystara, so I'm not sure what to say there.